Now we all know what this is, but, improvements in colours and wear abilities are changing often. This is the most affordable form of bench top available for your kitchen bench top. But, by no means does this mean it won’t last. If you read my article on “How to Choose the Right Colours”, you will know how to choose the right laminate to suit your needs! Synthetic granite is man made from many chemicals, plastics and secret squirrel stuff. To form a solid colour approximately 12mm thick, this is what we call a solid surface top. With this type of product you have seamless joins (a join you can’t see). For service ability, if you scratch this product you can polish it out. 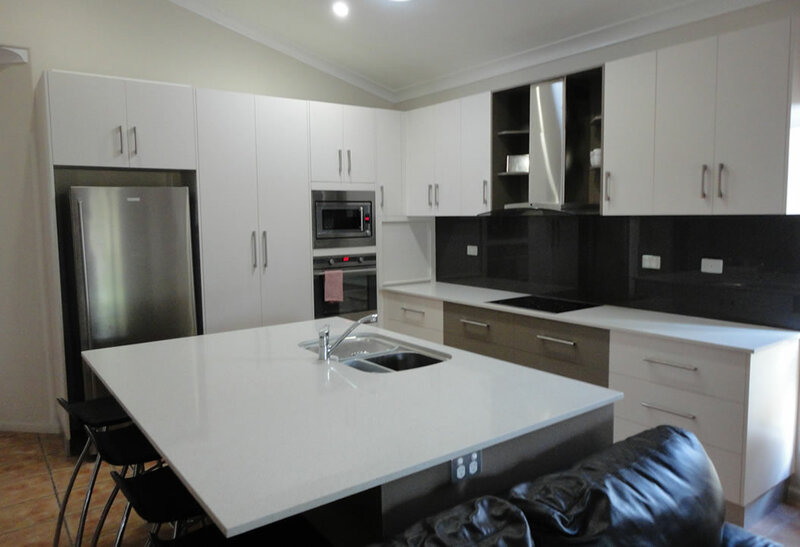 Approximate cost is 25% to 30% more that your overall kitchen cost eg. overall kitchen cost $10,000.00 then it will cost you $2,500.00 to $3,000.00 more for this type of product! I suppose the easiest way to explain how this is made, is like putting granite in a blender and then glue it back together! This type of solid surface is very much like real granite. It is 20mm thick, feels cold to touch and weighs about the same. The plus side to this sort of product is, it involves less pours and has a more even shine than granite. If it has a down side, I suppose that would be that some of the patterns don’t look real. I have this sort of top in my own kitchen – I liked the colour! Approximate cost is about 25% to 30% of the overall cost of a standard kitchen. Now let’s see, we all know what granite is, but bet you think you couldn’t afford it. Well, it’s not as expensive as many would think. The main difference between granite and engineered stone is granite has more natural patterns and colours. Because nature makes granite there are no two pieces of granite the same. Making all tops unique to your kitchen. Both granite and engineered stone, in my opinion, are the longest lasting of all available tops for kitchen bench tops. Approximate cost is 30% to 50% of overall cost of a standard kitchen. As a cabinet maker, I have a love of wood and that’s one of the reasons we become cabinet makers in the first place. Timber has a unique look, feel and smell. Like granite, know two pieces of timber are the same, so every kitchen top is different. This type of bench top can look fantastic. Probably it’s only downfall is that it can be hard to look after. Having a lacquered finish can scratch easily, so it will need to be maintained to retain it’s beauty! Due to the rising cost of furniture grade timber, this type of product can be around the same price as granite or higher. Last but not least, we have stainless steel bench tops. The main use is in commercial kitchens and hospitals. The reason for this, is it’s virtually indestructible and very hygienic! When using this in a residential kitchen you need to be careful as you don’t want it to look sterile. They now have some very trendy, easy to maintain textures to choose from! * All estimates are just that and should only be used as a guide. Price will vary depending on your kitchen shape. If your curious – just ask for a free quote.